Another artist's concept showing NASA's Mars 2020 rover exploring Mars. NASA's next Mars rover won't just explore the Red Planet; it will, the space agency hopes, make it so a little bit of Mars might make it to Earth. Known as Mars 2020, the upcoming rover will hunt for signs of habitable environments on Mars while searching for signs of past microbial life. The robotic traveler will also cache a series of samples that can be returned to Earth with a future mission. The mission is currently slated to blast off from Cape Canaveral, Florida, in July or August 2020, when Earth and Mars are positioned to require the least amount of power for interplanetary travel. It is scheduled to land in February 2021, with an initial mission duration of at least one Martian year, or 687 Earth-days. The car-sized rover is about 10 feet long (not including the arm), 9 feet wide, and 7 feet tall (about 3 meters long, 2.7 meters wide, and 2.2 meters tall). At 2,314 lbs. (1,050 kilograms), it weighs less than a compact car. If photos and sketches of the Mars 2020 rover look familiar, that's because the robotic explorer is largely based off its predecessor, the Mars Science Laboratory (MSL)'s Curiosity rover. Roughly 85 percent of the new rover's mass is based on this "heritage hardware." "The fact that so much of the hardware has already been designed — or even already exists — is a major advantage for this mission," Jim Watzin, director of NASA's Mars Exploration Program, said in a statement. "It saves us money, time and most of all, reduces risk." Like Curiosity, Mars 2020 will have a rectangular body, six wheels, an arm and hand, cameras and instruments, and a drill for sampling rocks. But the new rover has different goals that require a suite of cutting-edge instruments. Using an X-ray spectrometer and an ultraviolet laser, Mars 2020 will seek out bio-signatures from the past on a microbial scale. A ground-penetrating radar will be the first instrument to look under the surface of Mars, mapping layers of rock, water and ice up to 30 feet (10 m) deep. These upgrades will kick in before the rover ever touches the surface of Mars. NASA's Jet Propulsion Laboratory, which is developing and managing the mission for the space agency, is developing a new landing technology called terrain-relative navigation. As the mission hardware approaches the Martian surface, it will use a computer to compare the landscape with pre-loaded terrain maps, guiding the descending mission to a safe landing site and making corrections on the way down. A related feature, known as a range trigger, will use location and velocity to determine when to open the spacecraft's parachute, narrowing the landing ellipse by more than half. "Terrain-relative navigation enables us to go to sites that were ruled too risky for Curiosity to explore," said JPL's Al Chen, the Mars 2020 entry, descent and landing lead. "The ranger trigger lets us land closer to areas of scientific interest, shaving miles — potentially as much as a year — off a rover's journey." "It is quite a ride," Ian Clark of JPL, the test's technical lead, said in a statement. "The imagery of our first parachute inflation is almost as breathtaking to behold as it is scientifically significant. For the first time, we get to see what it would look like to be in a spacecraft hurtling towards the Red Planet, unfurling its parachute." Illustration depicting the science instruments slated to be carried aboard NASA’s Mars 2020 rover. Mars 2020 will boast nearly five times as many cameras as the first Mars rover. Sojourner carried only five cameras, and the twin rovers Spirit and Opportunity were designed with 10 cameras apiece. Curiosity has 17. The new rover will carry 23 cameras. Some will provide more color and 3D imaging than on Curiosity, according to Jim Bell of Arizona State University, Tempe, the principle investigator for 2020's Mastcam-Z. "Z" stands for "zoom," one of the improvements on Curiosity's high-definition Mastcam. The engineering cameras for planning drives and avoiding hazards on Spirit, Opportunity and Curiosity all captured 1-megapixel images in black and white. 2020's engineering cameras will acquire high-resolution, 20-megapixel color images. Their wider field of view means that, instead of spending time taking multiple images to be stitched together on the ground, the new cameras can capture the same view in a single snapshot. The cameras can also reduce motion blur, so they can snap images while the rover is traveling. More detailed images mean more data to beam through space. Smarter rover cameras are helping to reduce the load. On Spirit and Opportunity, compression was done on the onboard computer. Mars 2020, like Curiosity, will have its compression performed by electronics built into the camera. Data will be beamed back to Earth through spacecrafts already orbiting Mars: NASA's Mars Reconnaissance Orbiter (MRO), MAVEN and the European Space Agency's Trace Gas Orbiter. NASA's Mars Odyssey orbiter was the first orbiter to send rover data home from Spirit and Opportunity. "We were expecting to do that mission on just tens of megabits each Mars day, or sol," Bell said. "When we got that first Odyssey overflight, and we had about 100 megabits per sol, we realized it was a whole new ballgame." Mars 2020 will also carry a microphone, which can relay the sounds of the Red Planet back to Earth. "There's a lot of good science that can be done by having a microphone on Mars," Sylvestre Maurice, a planetary scientist at the Research Institute in Astrophysics and Planetology in France, told Space.com. 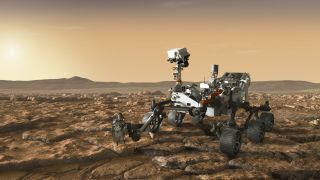 He and his colleagues investigated the possibility of pairing a microphone with a laser that will be used to vaporize rocks on the Martian surface. NASA has decided on three potential landing sites for the upcoming Mars 2020 mission: Northeast Syrtis, Jezero crater and Columbia Hills. As of March 2018, the final landing site for Mars 2020 had not yet been selected. In February 2017, a team of scientists narrowed down the list to three: Columbia Hills, Jezero Crater and Northeast Syrtis. One site has been explored before. Starting in 2004, the Mars exploration rover Spirit explored Gusev Crater and Columbia Hills, where the rover discovered evidence of past water, the only place it found water in the enormous crater. Later data analysis suggested that the crater may have once hosted a shallow lake. The Jezero Crater is an ancient lakebed where microbial life could have developed, NASA officials said in a statement. The river delta structure suggests that water filled and drained from the site at least twice, and MRO has identified minerals that have been chemically altered by water. An ancient volcano in Northeast Syrtis could have led to hot springs and melting ice, creating the ideal conditions for past microbial life. The edge of the Syrtis Major volcanoes exposes 4-billion-year-old bedrock, as well as many minerals altered by the encounter during the Red Planet's early history. The final selection of the landing site should come during a workshop in either 2018 or 2019, the researchers said during a 2015 meeting. "In the coming years, the 2020 science team will be weighing the advantages and disadvantages of each of these sites," Mars 2020 project scientist Ken Farley said. "It is by far the most important decision we have ahead of us." Unlike previous rovers, Mars 2020 will prepare samples to return to Earth. The rover will try to drill at least 20 rock cores, and possible more than 30 or 40. Samples will be secured in sample tubes and deposited at select locations for return on a potential future sample-retrieval mission. Such a mission has not yet been selected, so the samples may have to wait for years to hitch a ride back to Earth. "The Mars 2020 rover is the first step in a potential multi-mission campaign to return carefully selected and sealed samples of Martian rocks and soil to Earth," Geoffrey Yoder, then-acting associate administrator of NASA's Science Mission Directorate in Washington, D.C., said in a 2016 statement. "This mission marks a significant milestone in NASA's Journey to Mars — to determine whether life has ever existed on Mars, and to advance our goal of sending humans to the Red Planet." Assuming the samples make it to Earth, scientists will be able to use powerful instruments to provide a more in-depth examination than can be carried on the car-sized rover. The Scanning Habitable Environments with Raman and Luminescence for Organics and Chemicals (SHERLOC) laser instrument will be the first instrument on Mars to use Ramen and fluorescence spectroscopies, techniques familiar to forensics experts. When an ultraviolet light shines over certain carbon-based chemicals, they glow much like material beneath a black light. The glow can help scientists to detect chemicals that form in the presence of life. SHERLOC will photograph the rocks it studies, then maps the chemicals it detects across the images. "This kind of science requires texture and organic chemicals — two things that our target meteorite will provide," Rohit Bhartia of JPL, SHERLOC's deputy principal investigator, said in a statement.